A certain Radulfus, about 1290, got it into his head that whenever the word nemo (no man) occurred in Latin writings, it was no mere negation, but referred to a person of that name, whom he proved to be identical with the Son in the Holy Trinity. His own reading (as may well be believed) was small: but he paid monks and clerks to make a collection of such passages, mainly from the Bible, from which he composed a "Sermon upon Nemo" which he dedicated to Cardinal Benedict Caietan, afterwards Boniface VIII. The sermon still exists in different versions, and an adversary assures us that Radulfus founded a sect of Neminians, among whom he names Peter of Limoges. This adversary, Stephanus de S. Georgio, "must have been as great a fool as Radulfus to think of refuting him," as Denifle truly remarks. Here is the beginning of Radulfus's sermon:—"Beloved, God at sundry times and in divers manners spoke in times past to the fathers by the prophets, who preached darkly and with uncertain voice that the Only Begotten Son of God would come to redeem those who sit in darkness and in the shadow of death; but in these last days He speaketh openly by His Holy Scripture, preaching, setting forth, and testifying the most blessed Noman as His own compeer, born before all ages, (as it is written in the 138th Psalm [v. 16], 'days shall be formed, and Noman in them:' that is, He was before the Prophet David himself), yet hitherto unknown to mankind by reason of their sins. But our Lord and Saviour Himself, whose nature it ever is to spare and show pity, and Who never leaves His own unheard, hath taken pity on the people redeemed by His precious blood; and, having removed the old darkness altogether from our eyes, hath vouchsafed to discover to us the precious treasure of this most glorious Noman; that whereas, to our great loss, he hath hitherto been hidden, we may be able henceforth to behold him with the eye of faith. The blessed Noman, therefore, is found in Holy Scripture to be co-eval with God the Father, and in essence most like unto the Son, as not created nor proceeding, but born: wherein this is plainly said by the Psalmist, 'Days shall be formed, and Noman in them.' Afterwards his authority grew deservedly so great that, as though scorning earthly things, he soared with marvellous flight to the highest heaven, as it is written 'Noman hath ascended into heaven.'" And so on, through, "Noman hath seen God," "Noman knoweth the Father," "Noman knoweth the Son," "Noman can do these signs which thou dost," and a long catalogue of similar quotations. Stephanus, in his treatise addressed to the same Cardinal Caietan, takes these quotations one by one, and explains each painfully away: after which he proceeds to confute Eadulfus by a string of counter-quotations from the Decretals: e.g., "Noman sunk in sin," "to Noman did God give easy occasion of sin," "to Noman doth the Church shut her breast when he would fain return:" and he clenches the matter with the triumphant argument that God, Who would have all men saved, would therefore have Noman damned everlastingly: after which he concludes by calling on the secular and religious authorities present at the Provincial Council of Paris to burn these Neminians and their writings. One might be tempted to take it all for an elaborate hoax but for the abundant medieval evidence of the same sort, and for the fact that Stephen's memoir is solemnly filed among the Vatican archives. The various lives of Saint Nemo in medieval texts are studied by Martha Bayless in Parody in the Middle Ages: The Latin Tradition (Ann Arbor 1996), where he is discussed pp. 57ff and where texts of various lives of him are given pp. 259-310. 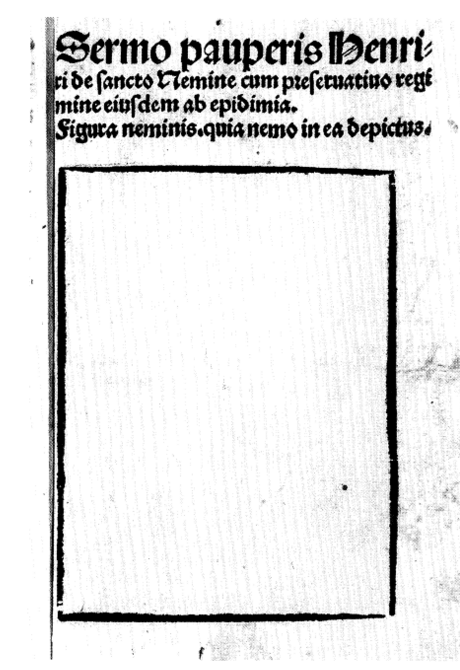 The frontispiece of the book shows a picture of the Saint from a sixteenth century printed edition, a blank square with the surrounding Latin: "Sermo pauperis Henrici de sancto Nemine: . . . figura neminis quia nemo in ea depictus" -- "sermon of Henry the pauper concerning Saint Nemo: . . . [this is] an image of no one because no one is depicted in it". 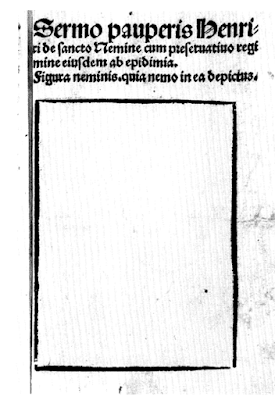 When the author submitted a thesis with this illustration to the Cambridge University Library, it was at first rejected because "one of the illustrations is blank". She commented that this just proved that a joke that worked in Cambridge four hundred years ago was still working today.